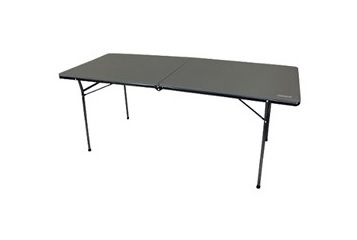 The COLEMAN Fold in Half 6 Foot Table is a lightweight and sturdy. This table can hold up to a whopping 250kg of static weight. It features no pinch locks and hinge locking mechanisms. No more opening while you are carrying them. The Six Foot vacuum molded fold in half table is lightweight. Sturdy and can hold up to a whopping 250kg. Perfect for event, markets and camping. Can be used indoor or outside. Great for catering or just for fun. Designed with users in mind with great features such as no pinch locks and hinge locking mechanisms. No more tables opening while you are carrying them, or fearing for your fingers while you are setting up.